You are currently browsing the tag archive for the ‘Wildflowers’ tag. 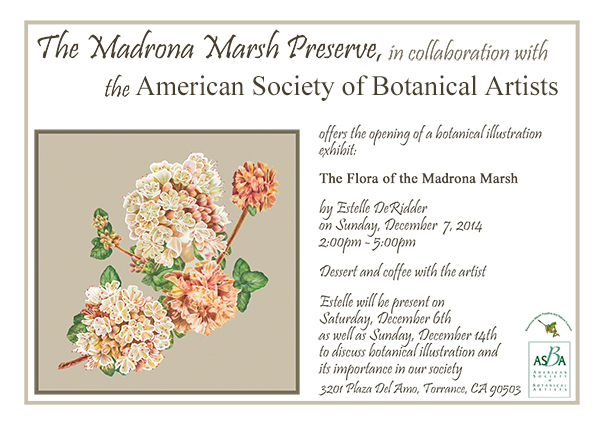 Invitation to “The Flora of the Madrona Marsh,” original artwork by Estelle De Ridder. due to Pearl Harbor Day. Some Madrona Marsh members who are interested in attending the opening had a conflict with the later afternoon times, and we are doing our best to accommodate everyone’s schedule during this busy time of year. I am at the Madrona Marsh on Saturdays and Sundays, and interest is brisk. Hope to see you there! Astragalus trichopodus with Glaucopsyche lygdamus palosverdesensis, Common names: Locoweed with Palos Verdes Blue Butterfly. Estelle De Ridder, © 2014, all rights reserved. 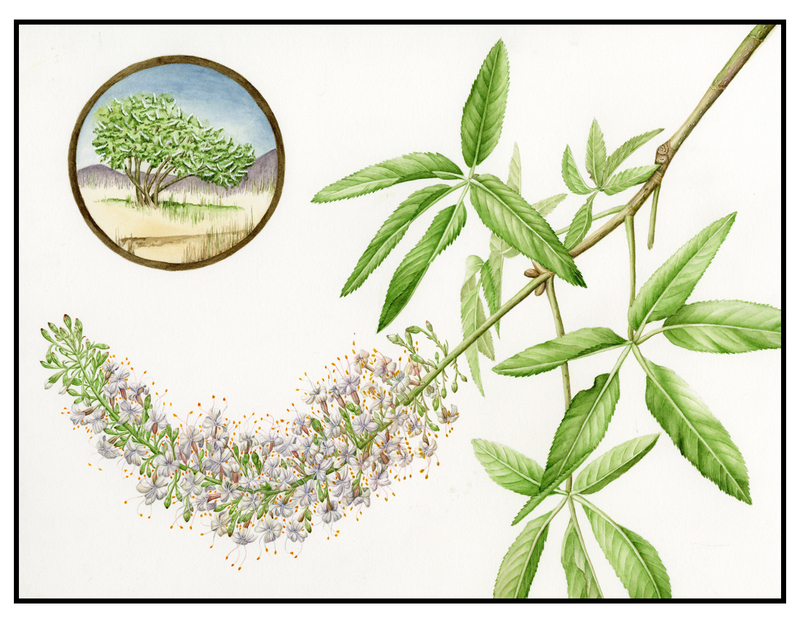 In 2012, BAGSC member Estelle DeRidder was awarded an education grant from the American Society of Botanical Artists (ASBA) to assist with creating sets of reusable plant identification cards featuring native plant illustrations from the Madrona Marsh Preserve in Torrence, California. 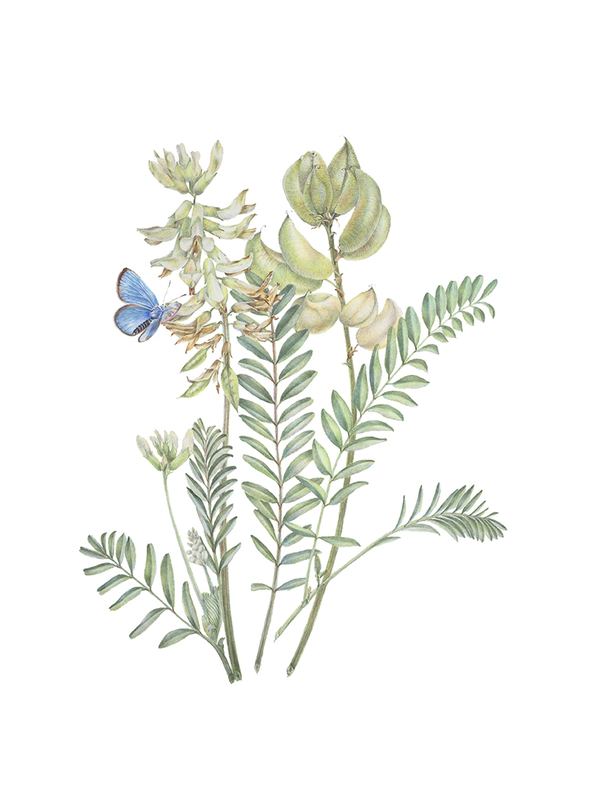 The Madrona Marsh Preserve, in collaboration with the ASBA has announced the opening of an exhibition of Estelle’s completed artwork, “The Flora of the Madrona Marsh” on Sunday, December 7, 2014, from 2 pm to 5 pm. The exhibition will run from November 19, 2014 – January 9, 2015. 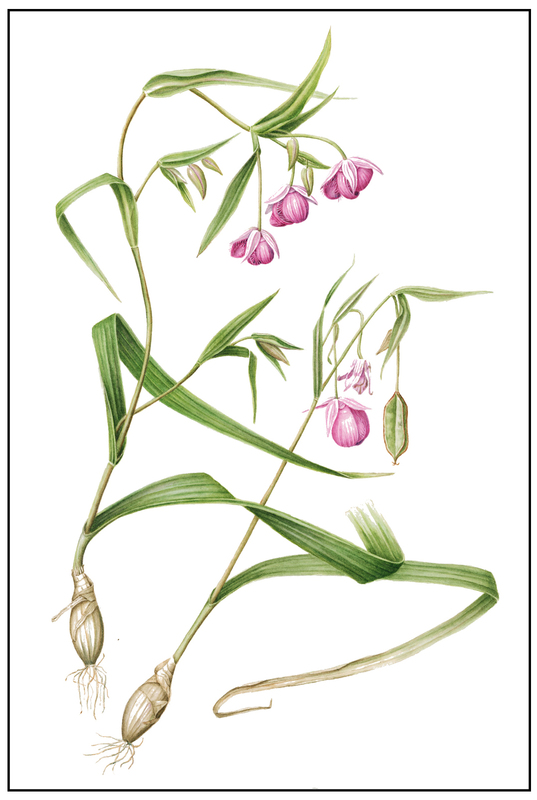 Estelle also will make two presentations at the Madrona Marsh Preserve, one on Saturday, December 6, 2014 and another on Sunday, December 14, 2014, discussing botanical illustration and its importance in our world. Information about Estelle’s project will be presented at the ASBA Annual Meeting and Conference in Denver, Colorado during the ASBA Grant Presentations on Friday evening, October 17, 2014 from 4:30 pm to 6:30 pm. The exhibition will then travel to the La Crescenta Public Library in La Crescenta, California from January 24 – February 28, 2015. Quercus Agrifolia, Coast Live Oak, by Estelle De Ridder, © 2014, all rights reserved. BAGSC member Deborah Shaw will be teaching “Journaling in your Garden” workshops during the month of June at the J. Paul Getty and Bowers Museum. 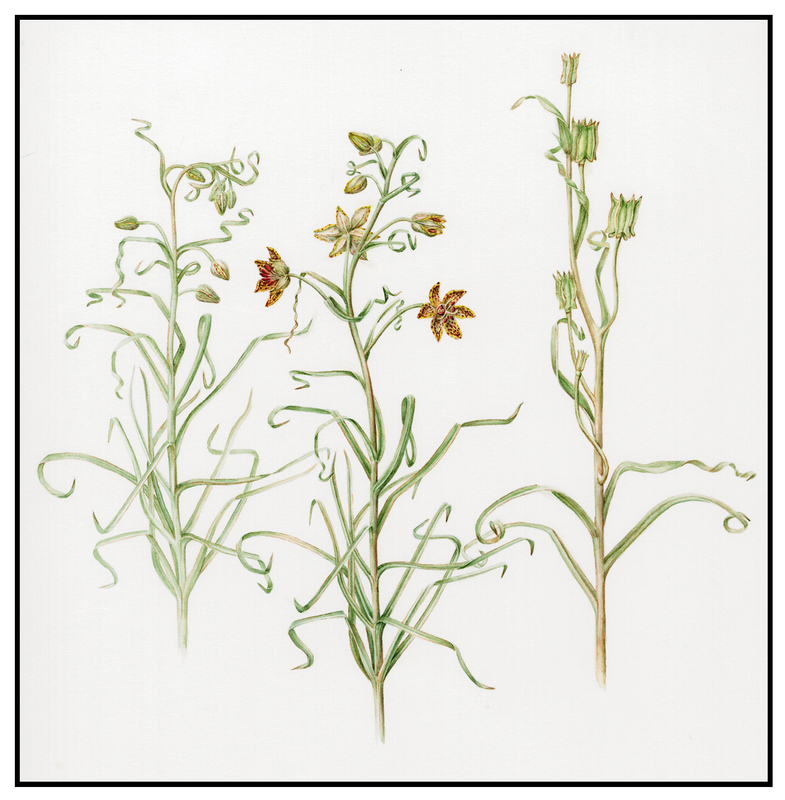 On Sundays, June 1 and June 15, 2014, 3:30 – 5:30 pm, Deb will be teaching “Drawing from the Masters: Creating a Garden and Wildflower Journal.” These workshops are part of the Getty’s tradition of sketching from original works of art every first and third Sundays of the month. “Creating a Garden and Wildflower Journal” will focus on the value of journaling, what to look for, and how to draw leaves and flowers. The workshop is free, and all experience levels are welcome. Participants are encouraged to bring sketchpads. Sign-up begins at 2:30 pm the day of the workshop at the main information desk, no preregistration required. The Getty Center is located at 1200 Getty Center Drive, Los Angeles, CA 90049. Admission is always free; parking is $15.00. Deborah also will be teaching a two-part series on Tuesdays, June 10 and June 17, 2014, 1:00 pm – 4:00 pm in the John M. Lee Court at Bowers Musuem. 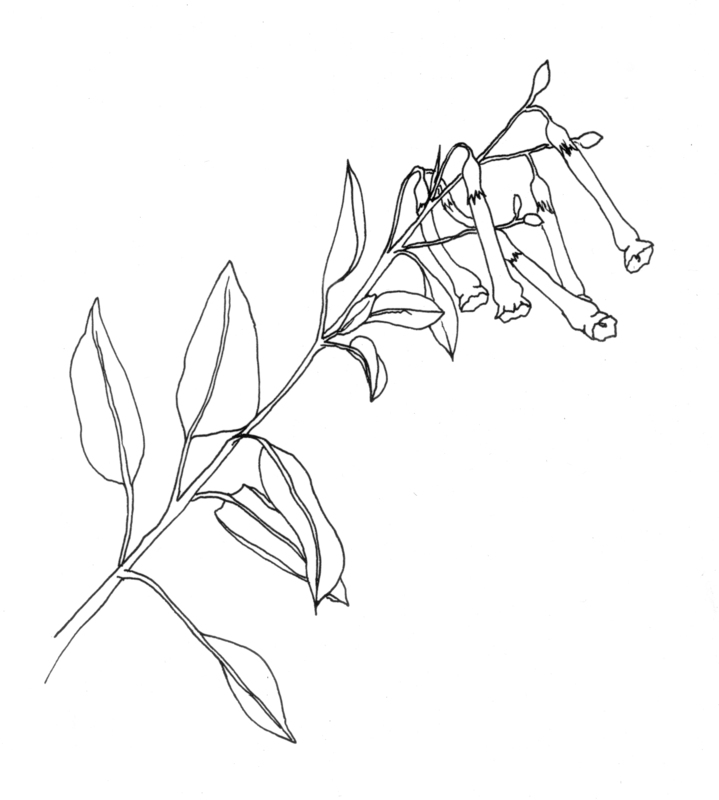 Drawing and Painting Wildflowers and Flowers from your Garden will cover what to look for when looking at flowers and leaves, perspective tips, and graphite and color techniques to quickly capture plants and wildflowers in your journal. Costs for individual classes are $15.00 for Bowers members, and $25.00 for non-members. Both workshops are available for Bowers members for $25.00, and $35.00 for non-members. A $15.00 materials fee is payable at the time of the class. Advance reservations required to enable the accurate purchase of supplies: e-mail or call the Education Department at 714.567.3677. These workshops complement lectures at the Bowers on Renaissance Gardens (June 7) and Wildflowers (June 21). Bryan C. Keene, assistant curator of manuscripts at the J. Paul Getty Museum will be giving the lecture about Renaissance Gardens. BAGSC members who participated in last Summer’s demonstrations at The Getty in conjunction with their “Gardens of the Renaissance” show will remember Bryan’s wonderful exhibition. Bryan will discuss the design, function, and meanings behind the many types of gardens planted in Europe between 1400-1600. Delve into illuminated manuscripts to discover how art, science, religion, myth, diet, and world travel shaped the evolving Renaissance garden. The “Wildflowers” lecture and book signing will be given by Robert L. Allen. His recent publications, “Wildflowers of Orange County and the Santa Ana Mountains” can be purchased at the Bowers Gallery Store. Bowers Museum is located in Santa Ana, CA, at 2002 North Main Street, 92706. Directions are included in the link above to Bowers Museum. SpringTopia is at the Arboretum, Celebrating a World of Plants! SpringTopia features guest speakers, walking tours with experts, music, children’s activities and entertainment, botanical art and mosaic demonstrations, Gift Shop specials, delicious food at the Peacock Café, free tram tickets for Arboretum members, and colorful blooms at Wildflowering L.A.
A full schedule of activities are on the Arboretum’s website. Arrayed in their natural glory. 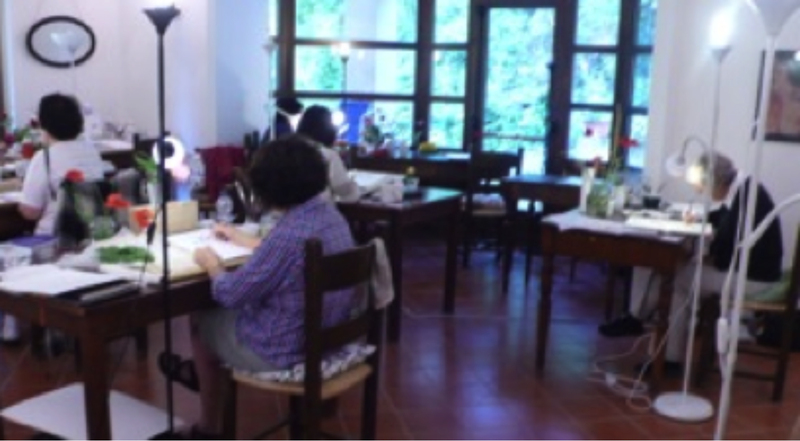 John and I just returned from Umbria, Italy, where I took Elaine Searle’s Botanical Art Class. 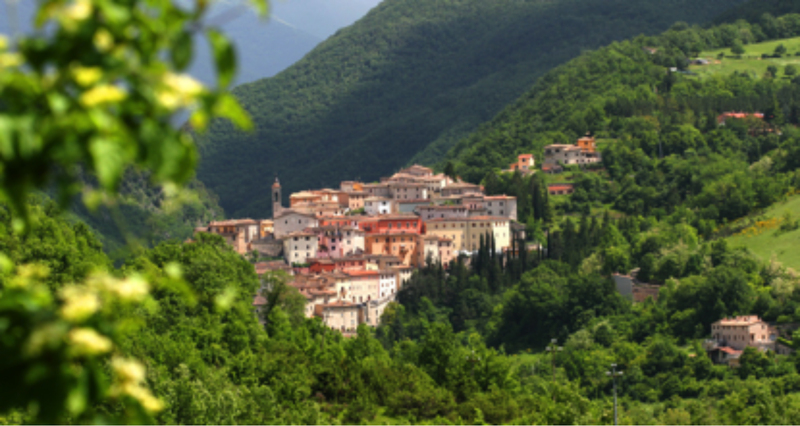 We stayed for eight days at a resort, Il Collaccio, in the mountains near the walled hill town of Preci and adjacent to the Monti Sibillini National Park. 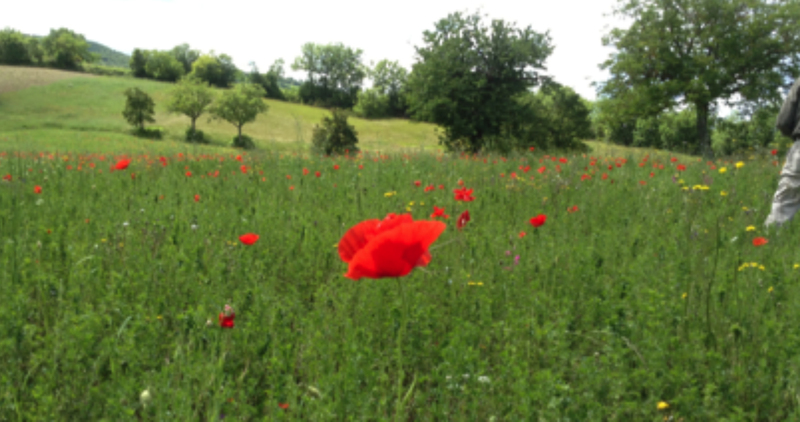 The views of the mountains and valleys were beautiful; the fields were filled with wildflowers: red poppies, small wild orchids, fringed hyacinths, buttercups, and many flowers that I had never seen before. We were a group of 13 including Elaine: four Americans including Deborah Friedman and myself from BAGSC, six women from Britain, three ladies from Finland, Japan, and Trinidad respectively. We stayed in a lovely stone building in which the studio was also located. Il Collaccio provided all of our meals. 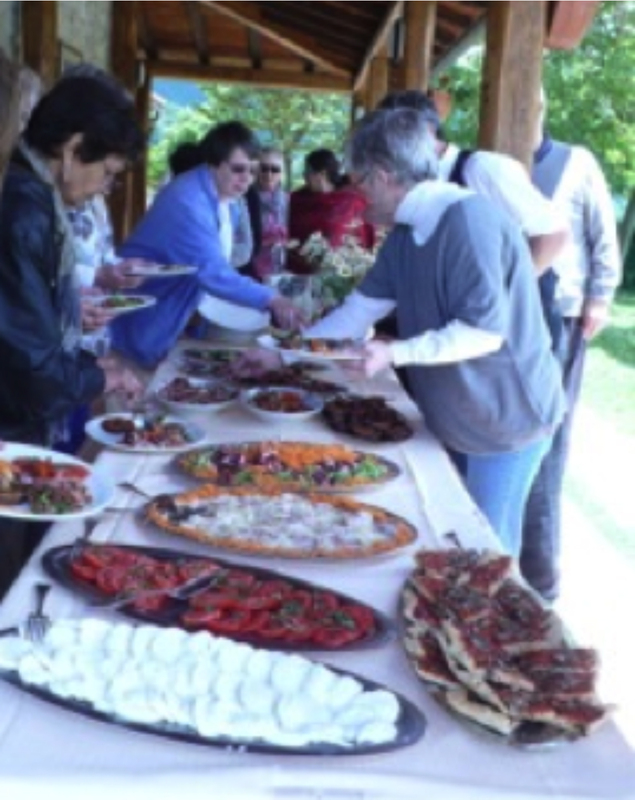 They were very good, especially the lunches which were interesting, varied and served outside if the weather permitted. There was no assigned subject. We could paint wildflowers, vegetables from the local market, or roses growing on the wall of our building. I chose to paint the poppies and a small orchid called the Bee Orchid. Elaine gave a demonstration every morning on one of the selected subjects. We worked from 9:30 am until 1:00 pm when lunch was served. After lunch Elaine was available in the studio if we wished to continue painting, or we could take the afternoon off for a hike in the hills or a visit to one of the many Umbrian hill towns. On one of the days we had a group outing to Spello, another beautiful walled town, and Fabriano where we were given a tour of the Fabriano Museum. Fabriano not only makes high quality art paper, they also make the paper for the Euro. 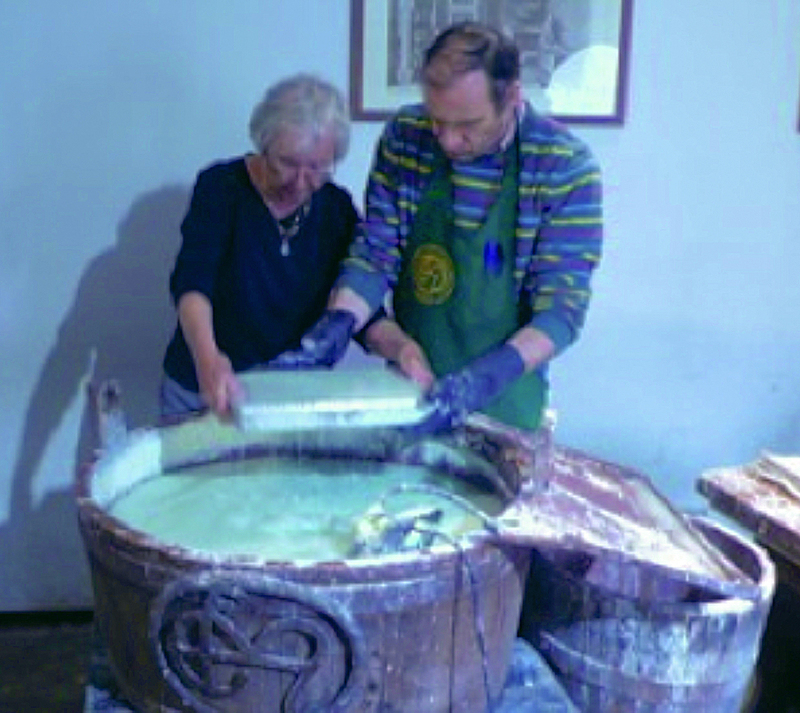 We were shown how paper was originally made by hand in the 16th century and their extensive collection of watermarks. At the end of the tour we all made a piece of paper. It was a great trip—an opportunity to see a really beautiful part of Italy, to meet new and interesting people, and to concentrate on drawing and painting without the many distractions and obligations of daily life. Bee Orchid, Ophrys apifera, watercolor by Joan Keesey, © 2013, all rights reserved. 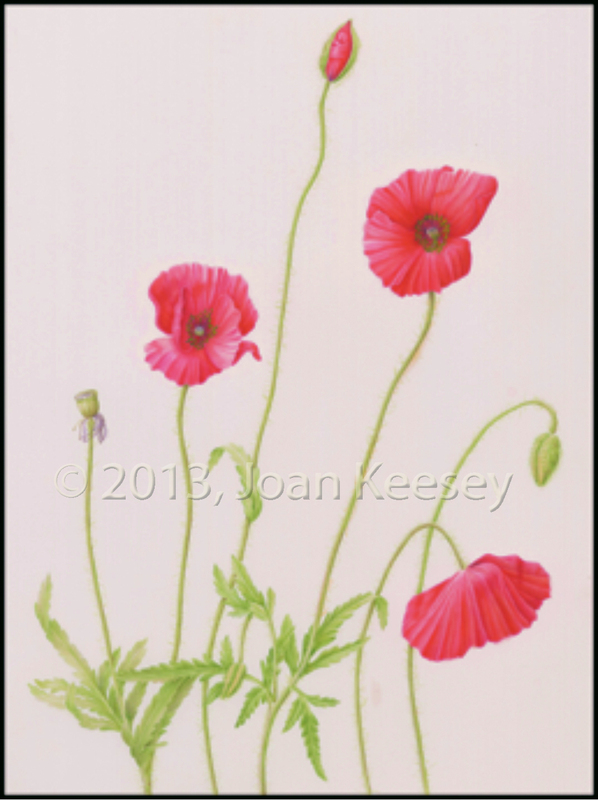 Common Poppy, Papaver rhoras, watercolor by Joan Keesey, © 2013, all rights reserved. This weekend ArtPlantae will participate in the First Annual Holiday Party at Aurea Vista, Riverside’s newest shopping destination. The holidays aren’t the only thing to celebrate this weekend, however. ArtPlantae is celebrating the launch of a new plant-based education display featuring resources for children, parents and teachers. Dedicated specifically to botany and botanical art education, this section features curriculum by the National Gardening Association, children’s books about plants (in English and Spanish), instructional books about drawing and botanical art, plant identification guides, and the Colorful Edibles coloring book published by the American Society of Botanical Artists. When visiting ArtPlantae at Aurea Vista, don’t miss the display area upstairs featuring books about contemporary botanical art and botanical art history. Discover more this Saturday during the holiday party. The festivities begin at 4:00 pm and continue until 9:00 pm. Meet local artists and designers and finish your holiday shopping too. Visit ArtPlantae’s new area about plant-based education and receive a free gift. It is located downstairs across from the children’s boutique. Stop by on your way to the Festival of Lights and the Artists Collective located just down the street on the Main Street Pedestrian Mall. Free gifts available while supplies last. Aurea Vista is located in a building in downtown Riverside, California whose life began in 1927 as a hotel built by architect G. Stanley Wilson. Today the building serves as an exciting new marketplace for local artisans, designers, importers, food sellers and craftspeople. Visit Aurea Vista and discover many treasures such as delicious olive oils by Beyond the Olive, terrarium designs by Brenda Cook of Botanical Perspective, and yards of inspiration (and classes too!) at Raincross Fiber Arts. Aurea Vista is located at 3498 University Avenue in Riverside on the corner of Lemon and University. Hours are Monday-Saturday (11-8), Sunday (11-5). Store hours are extended for Riverside’s monthly ArtsWalk and other special events. Parking: Free customer parking is available across the street in the parking lot with the ballet mural. Aurea Vista customers can park in spaces #1-8 that face University Avenue. Street parking is free after 5 PM Monday-Friday. Street parking also is free on Saturday and Sunday. January’s coming up fast, and the Chapman University Leatherby Library Drought Tolerant Plant Exhibition will be upon us (along with all the other exhibition opportunities we have stacked up for the month — but more on those later!). All BAGSC members will receive an email with the official BAGSC “Call for Entries” packet. If you do not receive this email with the attachment by 30 November, please contact Deb. The following are plants that BAGSC members are planning to submit. Botanical and common names, of course, will need to be reviewed and verified. Don’t worry if you have to change your mind, or if you’re already painting something that someone else is painting on the list below. This is a preliminary list and is not set in cement. Space allowing, species duplicates will be accepted (see the Call for Entries packet). Add your name and plants to the list: contact Diane. It’s shaping up to be a great show!!! Here is another show opportunity for BAGSC members. Descanso Gardens has asked us to exhibit paintings of Wild Flowers from January through March — exact dates to come later. Paintings for the exhibition must be originals, framed and matted, and can have been shown elsewhere. Contact Leslie with information regarding which wild flowers you would like to exhibit, and how many paintings you might have for this show as soon as possible. More information will be passed on to you as it is received. Calochortus amoenus (Rosy Fairy Lantern), watercolor by Joan Keesey, © 2012, all rights reserved. Joan Keesey, BAGSC member and membership chair, will be having an exhibition of botanical watercolors, “Wild Flowers of Mineral King” at the Theodore Payne Foundation for Wild Flowers and Native Plants (TPF), Friday, March 30 – Saturday, June 30, 2012. An opening reception for the artist will be held Saturday, March 31, 2012, from 2:00 pm – 4:30 pm. The opening reception coincides with “Poppy Day” at the TPF, their annual spring plant sale event, which takes place from 8:30 am to 4:30 pm on March 31. Hundreds of different native California species and cultivars will be available to choose from — a great opportunity for those BAGSC members who would like to paint California natives for the Chapman University exhibition on drought-tolerant plants. TPF members will receive 15 percent off all plants in 4-inch containers, one gallon containers and up. Non-members will receive 10 percent off those same plants, and memberships will be sold at the door. 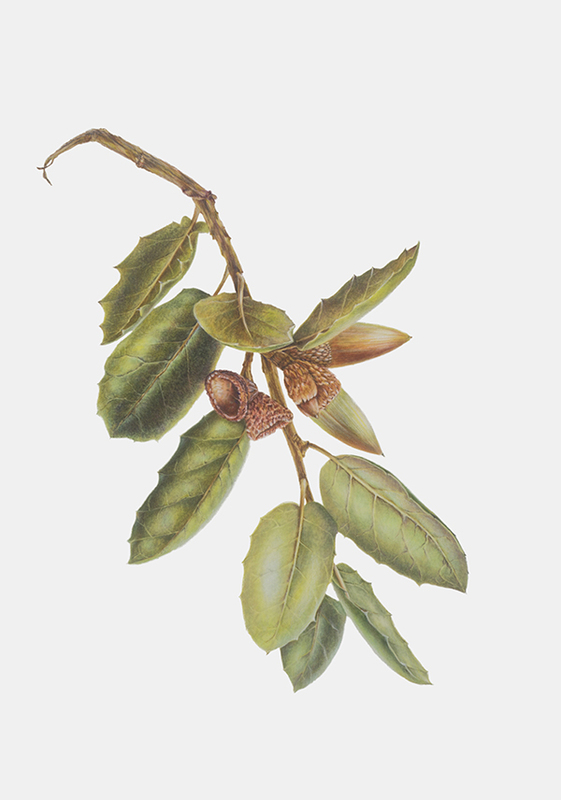 California Buckeye, watercolor by Joan Keesey, © 2012, all rights reserved. The TPF is located at 10459 Tuxford Street, in Sun Valley, California 91352. The phone number is 818.768.5215 and the wildflower hotline number is 818.768.3533. Davidson's Fritillary, watercolor by Joan Keesey, © 2012, all rights reserved.